Not to be confused with Guinea, Equatorial Guinea, or Papua New Guinea. Guinea-Bissau ( /ˈɡɪni bɪˈsaʊ/), officially the Republic of Guinea-Bissau (Portuguese: República da Guiné-Bissau [ʁeˈpublikɐ dɐ ɡiˈnɛ biˈsaw]), is a sovereign state in West Africa. It covers 36,125 square kilometres (13,948 sq mi) with an estimated population of 1,815,698. Only 14% of the population speaks noncreolized Portuguese, established as both the official and national language. Portuguese exists in creole continuum with Crioulo, a Portuguese creole spoken by half the population (44%) and an even larger number speaks it as second tongue. 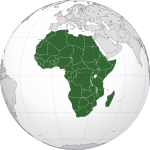 The remainder speak a variety of native African languages. There are diverse religions in Guinea-Bissau with no one religion having a majority. The CIA World Factbook (2018) states there are about 40% Muslims, 22% Christians, 15% Animists and 18% unspecified or other. The country's per-capita gross domestic product is one of the lowest in the world. Guinea-Bissau is a member of the United Nations, African Union, Economic Community of West African States, Organisation of Islamic Cooperation, Community of Portuguese Language Countries, La Francophonie and the South Atlantic Peace and Cooperation Zone, and was a member of the now-defunct Latin Union. Guinea-Bissau was once part of the kingdom of Gabu, part of the Mali Empire; parts of this kingdom persisted until the 18th century. Other parts of the territory in the current country were considered by the Portuguese as part of their empire. 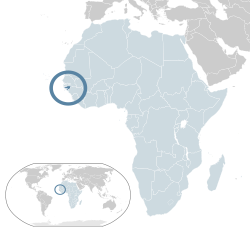 Portuguese Guinea was known as the Slave Coast, as it was a major area for the exportation of African slaves by Europeans to the western hemisphere. Early reports of Europeans reaching this area include those of the Venetian Alvise Cadamosto's voyage of 1455, the 1479–1480 voyage by Flemish-French trader Eustache de la Fosse, and Diogo Cão. In the 1480s this Portuguese explorer reached the Congo River and the lands of Bakongo, setting up the foundations of modern Angola, some 4200 km down the African coast from Guinea-Bissau. Flag of the Portuguese Company of Guinea. Although the rivers and coast of this area were among the first places colonized by the Portuguese, who set up trading posts in the 16th century, they did not explore the interior until the 19th century. The local African rulers in Guinea, some of whom prospered greatly from the slave trade, controlled the inland trade and did not allow the Europeans into the interior. They kept them in the fortified coastal settlements where the trading took place. African communities that fought back against slave traders also distrusted European adventurers and would-be settlers. The Portuguese in Guinea were largely restricted to the ports of Bissau and Cacheu. A small number of European settlers established isolated farms along Bissau's inland rivers. For a brief period in the 1790s, the British tried to establish a rival foothold on an offshore island, at Bolama. But by the 19th century the Portuguese were sufficiently secure in Bissau to regard the neighbouring coastline as their own special territory, also up north in part of present South Senegal. An armed rebellion, begun in 1956 by the African Party for the Independence of Guinea and Cape Verde (PAIGC) under the leadership of Amílcar Cabral gradually consolidated its hold on the then Portuguese Guinea. Unlike guerrilla movements in other Portuguese colonies, the PAIGC rapidly extended its military control over large portions of the territory, aided by the jungle-like terrain, its easily reached borderlines with neighbouring allies, and large quantities of arms from Cuba, China, the Soviet Union, and left-leaning African countries. Cuba also agreed to supply artillery experts, doctors, and technicians. The PAIGC even managed to acquire a significant anti-aircraft capability in order to defend itself against aerial attack. By 1973, the PAIGC was in control of many parts of Guinea, although the movement suffered a setback in January 1973 when Cabral was assassinated. Independence was unilaterally declared on 24 September 1973. Recognition became universal following the 25 April 1974 socialist-inspired military coup in Portugal, which overthrew Lisbon's Estado Novo regime. Luís Cabral, brother of Amílcar and co-founder of PAIGC, was appointed the first President of Guinea-Bissau. Following independence, the PAIGC killed thousands of local Guinean soldiers who had fought alongside the Portuguese Army against the guerrillas. Some escaped to settle in Portugal or other African nations. One of the massacres occurred in the town of Bissorã. In 1980 the PAIGC acknowledged in its newspaper Nó Pintcha (dated 29 November 1980) that many Guinean soldiers had been executed and buried in unmarked collective graves in the woods of Cumerá, Portogole, and Mansabá. The country was controlled by a revolutionary council until 1984. The first multi-party elections were held in 1994. An army uprising in May 1998 led to the Guinea-Bissau Civil War and the president's ousting in June 1999. Elections were held again in 2000, and Kumba Ialá was elected president. In September 2003, a military coup was conducted. The military arrested Ialá on the charge of being "unable to solve the problems". After being delayed several times, legislative elections were held in March 2004. A mutiny of military factions in October 2004 resulted in the death of the head of the armed forces and caused widespread unrest. In June 2005, presidential elections were held for the first time since the coup that deposed Ialá. Ialá returned as the candidate for the PRS, claiming to be the legitimate president of the country, but the election was won by former president João Bernardo Vieira, deposed in the 1999 coup. Vieira beat Malam Bacai Sanhá in a run-off election. Sanhá initially refused to concede, claiming that tampering and electoral fraud occurred in two constituencies including the capital, Bissau. Despite reports of arms entering the country prior to the election and some "disturbances during campaigning," including attacks on government offices by unidentified gunmen, foreign election monitors described the 2005 election overall as "calm and organized". Three years later, PAIGC won a strong parliamentary majority, with 67 of 100 seats, in the parliamentary election held in November 2008. In November 2008, President Vieira's official residence was attacked by members of the armed forces, killing a guard but leaving the president unharmed. On 2 March 2009, however, Vieira was assassinated by what preliminary reports indicated to be a group of soldiers avenging the death of the head of joint chiefs of staff, General Batista Tagme Na Wai, who had been killed in an explosion the day before. Vieira's death did not trigger widespread violence, but there were signs of turmoil in the country, according to the advocacy group Swisspeace. Military leaders in the country pledged to respect the constitutional order of succession. National Assembly Speaker Raimundo Pereira was appointed as an interim president until a nationwide election on 28 June 2009. It was won by Malam Bacai Sanhá of the PAIGC, against Kumba Ialá as the presidential candidate of the PRS. On 9 January 2012, President Sanhá died of complications from diabetes, and Pereira was again appointed as an interim president. On the evening of 12 April 2012, members of the country's military staged a coup d'état and arrested the interim president and a leading presidential candidate. Former vice chief of staff, General Mamadu Ture Kuruma, assumed control of the country in the transitional period and started negotiations with opposition parties. Guinea-Bissau is a republic. In the past, the government had been highly centralized. Multi-party governance was not established until mid-1991. The president is the head of state and the prime minister is the head of government. Since 1974, no president has successfully served a full five-year term. At the legislative level, a unicameral Assembleia Nacional Popular (National People's Assembly) is made up of 100 members. They are popularly elected from multi-member constituencies to serve a four-year term. The judicial system is headed by a Tribunal Supremo da Justiça (Supreme Court), made up of nine justices appointed by the president; they serve at the pleasure of the president. The two main political parties are the PAIGC (African Party for the Independence of Guinea and Cape Verde) and the PRS (Party for Social Renewal). There are more than 20 minor parties. Guinea-Bissau follows a nonaligned foreign policy and seeks friendly and cooperative relations with a wide variety of states and organizations. A 2008 estimate put the size of the Guinea-Bissau Armed Forces at around 4,000 personnel. Rare salt water Hippopotamuses in Orango Island. Guinea-Bissau is bordered by Senegal to the north and Guinea to the south and east, with the Atlantic Ocean to its west. It lies mostly between latitudes 11° and 13°N (a small area is south of 11°), and longitudes 13° and 17°W. At 36,125 square kilometres (13,948 sq mi), the country is larger in size than Taiwan or Belgium. It lies at a low altitude; its highest point is 300 metres (984 ft). 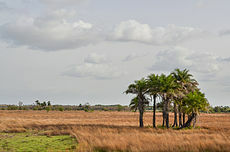 The terrain of is mostly low coastal plain with swamps of Guinean mangroves rising to Guinean forest-savanna mosaic in the east. Its monsoon-like rainy season alternates with periods of hot, dry harmattan winds blowing from the Sahara. The Bijagos Archipelago lies off of the mainland. Guinea-Bissau is warm all year around and there is little temperature fluctuation; it averages 26.3 °C (79.3 °F). 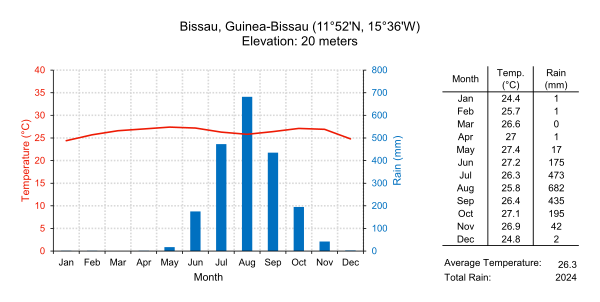 The average rainfall for Bissau is 2,024 millimetres (79.7 in) although this is almost entirely accounted for during the rainy season which falls between June and September/October. From December through April, the country experiences drought. Severe environmental problems include deforestation; soil erosion; overgrazing and overfishing. Seat of the Central Bank of Guinea-Bissau. Petrol station in São Domingos. Guinea-Bissau's GDP per capita is one of the lowest in the world, and its Human Development Index is one of the lowest on earth. More than two-thirds of the population lives below the poverty line. The economy depends mainly on agriculture; fish, cashew nuts and ground nuts are its major exports. A long period of political instability has resulted in depressed economic activity, deteriorating social conditions, and increased macroeconomic imbalances. It takes longer on average to register a new business in Guinea-Bissau (233 days or about 33 weeks) than in any other country in the world except Suriname. Guinea-Bissau has started to show some economic advances after a pact of stability was signed by the main political parties of the country, leading to an IMF-backed structural reform program. The key challenges for the country in the period ahead are to achieve fiscal discipline, rebuild public administration, improve the economic climate for private investment, and promote economic diversification. After the country became independent from Portugal in 1974 due to the Portuguese Colonial War and the Carnation Revolution, the rapid exodus of the Portuguese civilian, military, and political authorities resulted in considerable damage to the country's economic infrastructure, social order, and standard of living. After several years of economic downturn and political instability, in 1997, Guinea-Bissau entered the CFA franc monetary system, bringing about some internal monetary stability. The civil war that took place in 1998 and 1999, and a military coup in September 2003 again disrupted economic activity, leaving a substantial part of the economic and social infrastructure in ruins and intensifying the already widespread poverty. Following the parliamentary elections in March 2004 and presidential elections in July 2005, the country is trying to recover from the long period of instability, despite a still-fragile political situation. Beginning around 2005, drug traffickers based in Latin America began to use Guinea-Bissau, along with several neighboring West African nations, as a transshipment point to Europe for cocaine. The nation was described by a United Nations official as being at risk for becoming a "narco-state". The government and the military have done little to stop drug trafficking, which increased after the 2012 coup d'état. Guinea-Bissau is a member of the Organization for the Harmonization of Business Law in Africa (OHADA). (Left) Guinea-Bissau's population between 1961 and 2003. (Right) Guinea-Bissau's population pyramid, 2005. In 2010, 41.3% of Guinea-Bissau's population were aged under 15. According to the 2017 revision of the World Population Prospects, Guinea-Bissau's population was 1,815,698 in 2016, compared to 518,000 in 1950. The proportion of the population below the age of 15 in 2010 was 41.3%, 55.4% were aged between 15 and 65 years of age, while 3.3% were aged 65 years or older. Guinea-Bissau present-day settlement pattern of the ethnic groups. 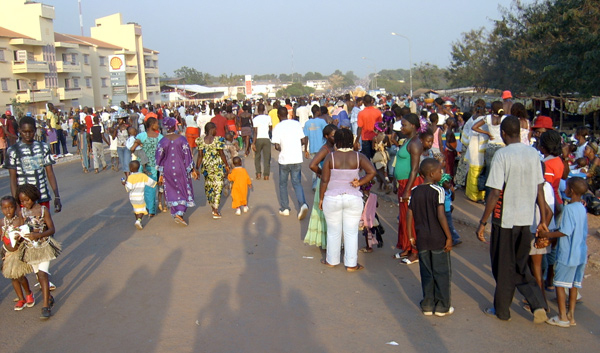 The population of Guinea-Bissau is ethnically diverse and has many distinct languages, customs, and social structures. Manjaco and Mancanha, who occupy the central and northern coastal areas. Most of the remainder are mestiços of mixed Portuguese and African descent, including a Cape Verdean minority. Portuguese natives comprise a very small percentage of Bissau-Guineans. After Guinea-Bissau gained independence, most of the Portuguese nationals left the country. The country has a tiny Chinese population. These include traders and merchants of mixed Portuguese and Chinese ancestry from Macau, a former Asian Portuguese colony. Voter education posters in the Kriol language for Guinea-Bissau legislative election, 2008, Biombo Region. Despite being a small country Guinea-Bissau has several ethnic groups which are very distinct from each other, with their own cultures and languages. This is due that Guinea-Bissau was a refugee territory due to migrations within Africa. Colonization and miscegenation brought Portuguese and the Portuguese creole, the Kriol or crioulo. Although perceived as one of the national languages of Guinea-Bissau since independence, Standard Portuguese is spoken mostly as a second language, with few native speakers and often confined to the intellectual and political elites. It is the language of government and national communication as a legacy of colonial rule. Portuguese is the only language with official status; schooling from primary to university levels is conducted in Portuguese although only 67% of children have access to any formal education. Data suggested the number of Portuguese speakers ranges from 11 to 15%. The Portuguese creole is spoken by 44% which is effectively the national language of communication among distinct groups for most of the population. The Creole is still expanding, and it is understood by the vast majority of the population. However, decreolization processes are occurring, due to undergoing interference from Standard Portuguese and the creole forms a continuum of varieties with the standard language, the most distant are basilects and the closer ones, acrolects. A post-creole continuum exists in Guinea-Bissau and Crioulo 'leve' ('soft' Creole) variety being closer to the Portuguese-language norm. The remaining rural population speaks a variety of native African languages unique to each ethnicity: Fula (16%), Balanta (14%), Mandinga (7%), Manjaco (5%), Papel (3%), Felupe (1%), Beafada (0.7%), Bijagó (0.3%) and Nalu (0.1%), which form the ethnic African languages spoken by the population; English is used by 35%. Most Portuguese and Mestiços speakers also have one of the African languages and Kriol as additional languages. Ethnic African languages are not discouraged, in any situation, despite their lower prestige. These languages are the link between individuals of the same ethnic background and daily used in villages, between neighbors or friends, traditional and religious ceremonies, and also used in contact between the urban and rural populations. However, none of these languages are dominant in Guinea-Bissau. French is taught as a foreign language in schools because Guinea-Bissau is surrounded by French-speaking nations. Guinea-Bissau is a full member of the Francophonie. Men in Islamic garb, Bafatá, Guinea-Bissau. In 2010, a Pew Research survey found that Christianity is practiced by 62% of the country's population, with Muslims making up the remaining 38%. Most of Guinea-Bissau's Muslims are of the Sunni denomination with approximately 2% belonging to the Ahmadiyya sect. Many residents practice syncretic forms of Islamic and Christian faiths, combining their practices with traditional African beliefs. Muslims dominate the north and east, while Christians dominate the south and coastal regions. The Roman Catholic Church claims most of the Christian community. The WHO estimates there are fewer than 5 physicians per 100,000 persons in the country, down from 12 per 100,000 in 2007. The prevalence of HIV-infection among the adult population is 1.8%. Only 20% of infected pregnant women receive anti retroviral coverage to prevent transmission to newborns. Malaria kills more residents; 9% of the population have reported infection, It causes three times as many deaths as AIDS. In 2008, fewer than half of children younger than five slept under antimalaria nets or had access to antimalarial drugs. The WHO's estimate of life expectancy for a female child born in 2008 was 49 years, and 47 years for a boy. Despite lowering rates in surrounding countries, cholera rates were reported in November 2012 to be on the rise, with 1,500 cases reported and nine deaths. A 2008 cholera epidemic in Guinea-Bissau affected 14,222 people and killed 225. The 2010 maternal mortality rate per 100,000 births for Guinea Bissau was 1000. This compares with 804.3 in 2008 and 966 in 1990. The under-5 mortality rate, per 1,000 births, was 195 and the neonatal mortality as a percentage of under-5 mortality was 24. The number of midwives per 1,000 live births was 3; one out of eighteen pregnant women die as a result of pregnancy. According to a 2013 UNICEF report, 50% of women in Guinea Bissau had undergone female genital mutilation. In 2010, Guinea Bissau had the seventh-highest maternal mortality rate in the world. Education is compulsory from the age of 7 to 13. Pre-school education for children between three and six years of age is optional and in its early stages. There are five levels of education: pre-school, elemental and complementary basic education, general and complementary secondary education, general secondary education, technical and professional teaching, and higher education (university and non-universities). Basic education is under reform, and now forms a single cycle, comprising 6 years of education. Secondary education is widely available and there are two cycles (7th to 9th classe and 10th to 11th classe). Professional education in public institutions is nonoperational, however private school offerings opened, including the Centro de Formação São João Bosco (since 2004) and the Centro de Formação Luís Inácio Lula da Silva (since 2011). Child labor is very common. The enrollment of boys is higher than that of girls. In 1998, the gross primary enrollment rate was 53.5%, with higher enrollment ratio for males (67.7%) compared to females (40%). Non-formal education is centered on community schools and the teaching of adults. In 2011 the literacy rate was estimated at 55.3% (68.9% male, and 42.1% female). Usually, the many different ethnic groups in Guinea-Bissau coexist peacefully, but when conflicts do erupt, they tend to revolve around access to land. 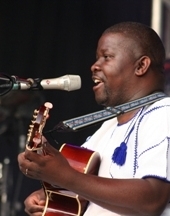 The music of Guinea-Bissau is usually associated with the polyrhythmic gumbe genre, the country's primary musical export. However, civil unrest and other factors have combined over the years to keep gumbe, and other genres, out of mainstream audiences, even in generally syncretist African countries. The calabash is the primary musical instrument of Guinea-Bissau, and is used in extremely swift and rhythmically complex dance music. Lyrics are almost always in Guinea-Bissau Creole, a Portuguese-based creole language, and are often humorous and topical, revolving around current events and controversies. The word gumbe is sometimes used generically, to refer to any music of the country, although it most specifically refers to a unique style that fuses about ten of the country's folk music traditions. Tina and tinga are other popular genres, while extent folk traditions include ceremonial music used in funerals, initiations and other rituals, as well as Balanta brosca and kussundé, Mandinga djambadon, and the kundere sound of the Bissagos Islands. Rice is a staple in the diet of residents near the coast and millet a staple in the interior. Fruits and vegetables are commonly eaten along with cereal grains. The Portuguese encouraged peanut production. Vigna subterranea (Bambara groundnut) and Macrotyloma geocarpum (Hausa groundnut) are also grown. Black-eyed peas are also part of the diet. Palm oil is harvested. Common dishes include soups and stews. Common ingredients include yams, sweet potato, cassava, onion, tomato and plantain. Spices, peppers and chilis are used in cooking, including Aframomum melegueta seeds (Guinea pepper). Flora Gomes is an internationally renowned film director; his most famous film is Nha Fala (English: My Voice). Gomes's Mortu Nega (Death Denied) (1988) was the first fiction film and the second feature film ever made in Guinea-Bissau. (The first feature film was N’tturudu, by director Umban u’Kest in 1987.) At FESPACO 1989, Mortu Nega won the prestigious Oumarou Ganda Prize. In 1992, Gomes directed Udju Azul di Yonta, which was screened in the Un Certain Regard section at the 1992 Cannes Film Festival. Gomes has also served on the boards of many Africa-centric film festivals. Football is the most popular sport in Guinea-Bissau. The Guinea-Bissau national football team is the national team of Guinea-Bissau and is controlled by the Federação de Futebol da Guiné-Bissau. They are a member of the Confederation of African Football (CAF) and FIFA. Other football clubs include Desportivo Quelele, FC Catacumba, FC Catacumba São Domingos, FC Cupelaoo Gabu, FC Djaraf, FC Prabis and FC Babaque. ^ "Guinea-Bissau" – Field Listing: Nationality. The World Factbook 2013–14. Washington, DC: Central Intelligence Agency, 2013. Retrieved 15 July 2015. ^ a b c d "Guinea-Bissau". International Monetary Fund. http://www.imf.org/external/pubs/ft/weo/2017/02/weodata/weorept.aspx?pr.x=96&pr.y=9&sy=2015&ey=2022&scsm=1&ssd=1&sort=country&ds=.&br=1&c=654&s=NGDPD%2CPPPGDP%2CNGDPDPC%2CPPPPC&grp=0&a=. ^ "2016 Human Development Report Summary". United Nations Development Programme. 2016. pp. 21–25. http://hdr.undp.org/sites/default/files/2016_human_development_report.pdf. Retrieved 21 March 2017. ^ Empire of Kaabu, West Africa. Access Gambia. Retrieved 22 June 2013. ^ Alvise Cadamosto. Nndb.com. Retrieved 22 June 2013. ^ Eustache De La Fosse (1992). Voyage d'Eustache Delafosse sur la côte de Guinée, au Portugal et en Espagne: 1479–1481. éditions Chandeigne. ISBN 978-2-906462-03-8. https://books.google.com/books?id=kMEIcypviaAC. Retrieved 19 December 2012. ^ a b "A Brief History of Guinea-Bissau – Part 1". Africanhistory, US Department of State, at About.com. Retrieved 22 June 2013. ^ British Library – Endangered Archive Programme (EAP). Inep-bissau.org (18 March 1921). Retrieved 22 June 2013. ^ Amilcar Cabral 1966 "The Weapon of Theory". Address delivered to the first Tricontinental Conference of the Peoples of Asia, Africa and Latin America held in Havana in January 1966. Marxists.org. Retrieved 22 June 2013. ^ The PAIC Programme Appendix. Marxists.org. Retrieved 22 June 2013.
. Event occurs at 50:00–60:00. ^ Brittain, Victoria (17 January 2011). "Africa: a continent drenched in the blood of revolutionary heroes". The Guardian (London). https://www.theguardian.com/global-development/poverty-matters/2011/jan/17/lumumba-50th-anniversary-african-leaders-assassinations. ^ Embassy of The Republic of Guinea-Bissau – Country Profile. Diplomaticandconsular.com (12 April 2012). Retrieved 22 June 2013. ^ Guiné-Bissau: Morreu Luís Cabral, primeiro presidente do país. Expresso.sapo.pt (30 May 2009). Retrieved 22 June 2013. ^ Guinea-Bissau's Kumba Yala: from crisis to crisis. Afrol.com. Retrieved 22 June 2013. ^ GUINEA-BISSAU: Vieira officially declared president. irinnews.org (10 August 2005). ^ "Army man wins G Bissau election". London: BBC News. 28 July 2005. http://news.bbc.co.uk/1/hi/world/africa/4723627.stm. Retrieved 5 January 2010. ^ Guinea Bissau vote goes smooth amid hopes for stability. AFP via Google.com (16 November 2008). Retrieved 22 June 2013. ^ Balde, Assimo (24 November 2008). "Coup attempt fails in Guinea-Bissau". London: The Independent UK independent.co.uk. https://www.independent.co.uk/news/world/africa/coup-attempt-fails-in-guineabissau-1032371.html. Retrieved 28 June 2010. ^ "Soldiers kill fleeing President". Archived from the original on 8 March 2009. https://web.archive.org/web/20090308111020/http://www.news.com.au/dailytelegraph/story/0,22049,25128786-5012772,00.html. Retrieved 2009-03-02. . news.com.au (2 March 2009). ^ Elections, Guinea-Bissau (27 May 2009). "On the Radio Waves in Guinea-Bissau". swisspeace. Archived from the original on 8 December 2009. https://web.archive.org/web/20091208151404/http://beforeproject.org/2009/05/on-the-radio-waves-in-guinea-bissau/. Retrieved 7 February 2010. ^ "Já foi escolhida a data para a realização das eleições presidenciais entecipadas". Bissaudigital.com. 1 April 2009. http://www.bissaudigital.com/noticias.php?idnoticia=3609. Retrieved 26 June 2010. ^ "Tiny Guinea-Bissau becomes latest West African nation hit by coup". Bissau. 12 April 2012. http://www.mcclatchydc.com/2012/04/12/145057/tiny-guinea-bassau-becomes-latest.html. Retrieved 14 April 2012. ^ Embalo, Allen Yero (14 April 2012). "Fears grow for members of toppled G.Bissau government". Agence France-Presse. Archived from the original on 3 March 2014. https://web.archive.org/web/20140303160107/http://www.google.com/hostednews/afp/article/ALeqM5gq-cyAdeGs3liZQlCd2mIxBvmQog?docId=CNG.a1b03f8f1a0eb41d95bf872bb307d7bf.681. Retrieved 2 May 2012. ^ "Guinea-Bissau opposition vows to reach deal with junta | Radio Netherlands Worldwide". Rnw.nl. 15 April 2012. Archived from the original on 12 October 2014. https://web.archive.org/web/20141012103639/http://www.rnw.nl/africa/bulletin/guinea-bissau-opposition-vows-reach-deal-junta. Retrieved 2 May 2012. ^ a b c d "Guinea-Bissau", CIA the World Factbook, Cia.gov. Retrieved 5 February 2012. ^ Guinea-Bissau Supreme Court Script error. Stj.pt. Retrieved 22 June 2013. ^ Guinea-Bissau Political Parties. Nationsencyclopedia.com. Retrieved 22 June 2013. ^ Guinea-Bissau Climate. Nationsencyclopedia.com. Retrieved 22 June 2013. ^ World Bank profile. World Bank.org (31 May 2013). Retrieved 22 June 2013. ^ The Economist. Pocket World in Figures (2008 ed.). London: Profile Books. ISBN 978-1861978448. ^ Guinea-Bissau and the IMF. Imf.org (13 May 2013). Retrieved 22 June 2013. ^ CFA Franc and Guinea-Bissau. Uemoa.int. Retrieved 22 June 2013. ^ Guinea-Bissau:A narco-state?. Time. (29 October 2009). Retrieved 22 June 2013. ^ Sullivan, Kevin (25 May 2008). "Route of Evil: How a tiny West African nation became a key smuggling hub for Colombian cocaine, and the price it is paying". The Washington Post. https://www.washingtonpost.com/wp-dyn/content/article/2008/05/24/AR2008052401676.html. ^ "Guinea-Bissau drug trade 'rises since coup'". London: BBC News. 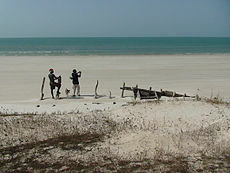 31 July 2012. https://www.bbc.co.uk/news/world-africa-19060861. Retrieved 5 October 2012. ^ "OHADA.com • The business law portal in Africa" (in French). Paul Bayzelon. http://www.ohada.com/index.php. Retrieved 10 January 2018. ^ a b "Population Division of the Department of Economic and Social Affairs of the United Nations Secretariat, World Population Prospects: The 2010 Revision". Esa.un.org. http://esa.un.org/unpd/wpp/index.htm. Retrieved 20 January 2017. ^ Guinea-Bissau ethnic classifications, Joshuaproject.net. Retrieved 22 June 2013. ^ China-Guinea-Bissau. China.org.cn. Retrieved 22 June 2013. ^ "Guinea-Bissau: Regions, Cities & Urban Localities - Population Statistics in Maps and Charts". 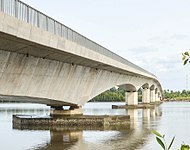 http://www.citypopulation.de/GuineaBissau.html. ^ a b c d e f g "Língua e Desenvolvimento: O caso da Guiné-Bissau José Barbosa – Universidade de Lisboa.". http://repositorio.ul.pt/bitstream/10451/18319/1/ulfl183078_tm.pdf. ^ Crioulo, Upper Guinea. Ethnologue.org. Retrieved 22 June 2013. ^ WELCOME TO THE INTERNATIONAL ORGANISATION OF LA FRANCOPHONIE'S OFFICIAL WEBSITE. Francophonie.org. Retrieved 22 June 2013. ^ a b "Tolerance and Tension: Islam and Christianity in Sub-Saharan Africa". Pew Forum on Religious & Public life. April 2010. http://www.pewforum.org/files/2010/04/sub-saharan-africa-full-report.pdf. Retrieved 25 April 2018. ^ Guinea-Bissau: Society & Culture Complete Report an All-Inclusive Profile Combining All of Our Society and Culture Reports. (2nd ed.). Petaluma: World Trade Press. 2010. p. 7. ISBN 1607804662. ^ The WHO estimates that there were 188 physicians working in the entire country as of 2007 ("Health workforce, infrastructure, essential medicines". 2009. p. 98. http://www.who.int/whosis/whostat/EN_WHS09_Table6.pdf. ). And the World Bank estimates that Guinea-Bissau had 1,541,040 residents in 2007 ("Midyear estimates of the resident population". 2010. https://www.google.com/publicdata?ds=wb-wdi&met=sp_pop_totl&idim=country:GNB&dl=en&hl=en&q=guinea-bissau+population. ). So, about 0.0122% of the permanent population were known to be medical doctors involved in patient care, as of 2007. ^ The WHO estimates a 1.8% HIV-infection rate from 2007 data among 15- to 49-year-old Bissau-Guineans – see statistics on page 65 of: "2. Cause-specific mortality and morbidity" (PDF). WHO. 2010. http://www.who.int/whosis/whostat/EN_WHS10_Part2.pdf. . (The section's introduction describes estimation methodology). ^ As of 2008, only 20% of HIV-infected mothers or sufferers with advanced cases had anti-retroviral drug access, see: "Health service coverage". WHO. 2010. p. 91. http://www.who.int/whosis/whostat/EN_WHS10_Part2.pdf. . Coverage in the general population is lower. ^ "Selected infectious diseases". WHO. 2010. p. 76. http://www.who.int/whosis/whostat/EN_WHS10_Part2.pdf. Retrieved 9 June 2010. – 148,542 reported cases in 2008. ^ According to the 2010 WHO report, the latest Malaria mortality rate per 100,000 Bissau-Guineans (180) is substantially greater than that for AIDS (65). ("Cause-specific mortality and morbidity". WHO. 2010. p. 64. http://www.who.int/whosis/whostat/EN_WHS10_Part2.pdf. Retrieved 9 June 2010. ) Among children younger than 5, malaria is nine times more deadly (p. 65). ^ "Global Health Indicators: 4. Health service coverage". WHO. 2010. p. 91. http://www.who.int/whosis/whostat/EN_WHS10_Part2.pdf. ^ "Global Health Indicators: Mortality and burden of disease". 2010. p. 50. http://www.who.int/whosis/whostat/EN_WHS10_Part2.pdf. . Healthy life expectancy at birth was 42. The probability of dying between a live-birth and age 5 was 19.5% (down from 24% in 1990, p.51). ^ "Guinea Bissau: Cholera On the Rise". 2012. http://allafrica.com/stories/201211141254.html?aa_source=mf-hdlns. Retrieved 15 November 2012. ^ "Country Comparison :: Maternal mortality rate". The World Factbook. https://www.cia.gov/library/publications/the-world-factbook/rankorder/2223rank.html. Retrieved 15 October 2014. ^ The latter is maintained by Cuba and functions in different cities. ^ a b "Guinea-Bissau". 2001 Findings on the Worst Forms of Child Labor. Bureau of International Labor Affairs, U.S. Department of Labor (2002). This article incorporates text from this source, which is in the public domain. ^ "Field Listing :: Literacy". The World Factbook. https://www.cia.gov/library/publications/the-world-factbook/fields/2103.html. Retrieved 15 October 2014. ^ Armando Mussa Sani and Jasmina Barckhausen (23 June 2017). "Theatre sheds light on conflicts". D+C, development and cooperation. https://www.dandc.eu/en/article/guinea-bissau-must-finally-apply-its-land-law-order-resolve-conflicts. Retrieved 15 August 2017. ^ Lobeck, Katharina (21 May 2003) Manecas Costa Paraiso di Gumbe Review. BBC. Retrieved 22 June 2013. ^ The Kora. Freewebs.com. Retrieved 22 June 2013. ^ Radio Africa: Guinea Bissau vinyl discography. Radioafrica.com.au. Retrieved 22 June 2013. ^ Music of Guinea-Bissau. Ccas11bijagos.pbworks.com. Retrieved 22 June 2013. ^ Mortu Nega. California Newsreel. Newsreel.org. Retrieved 22 June 2013. ^ Udju Azul di Yonta. California Newsreel. Newsreel.org. Retrieved 22 June 2013. ^ "Festival de Cannes: Udju Azul di Yonta". Archived from the original on 20 October 2014. https://web.archive.org/web/20141020080938/http://www.festival-cannes.com/en/archives/ficheFilm/id/68/year/1992.html. Retrieved 16 August 2009. ^ Flora Gomes The Two Faces of War: National Liberation in Guinea-Bissau. Watsoninstitute.org (25 October 2007). Retrieved 22 June 2013.